Playground ruins of the rich and famous. and that not too many people cared. The message that we cannot continue mindlessly fouling our own nest deserves more than the denial or despair in which we’ve been indulging ourselves in lieu of thought and concerted action. 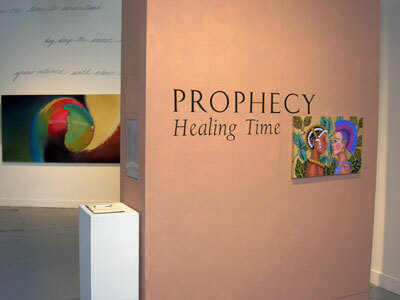 The poem, “Prophecy,” which came to William Torphy in a flash of inspiration, calls for a new global consciousness and environmental and spiritual healing. (Complete text at www.ProphecyHealing.org). The nine artists whose works embody this ancient paradigm of conscious, sustainable living fulfill the imperatives of the cultural moment with verve, commitment and sophistication. They exude pathos, sympathy for the victims of all cultures and periods, and a determined anger about this particular massacre of innocents — and its aftermath. Chema Gonzalez, in contrast, makes detailed watercolors celebrating daily village life in his native Guatemala. Traditional folkways are depicted with an almost scientific accuracy … which lends the paintings an anthropological feeling; the impassive expressions on the villagers’ nearly identical features reinforce the impression of artifice — of a way of life being depicted and memorialized rather than a unique moment captured. Three fishermen, father, son and grandson, go about their work on Lago Atitlan; children play a board game; a weathered oldster quaffs a drink below the rugged mountain that he has grown to resemble. Robert Hernandez’s depictions of thee American commercial landscape reveal a very different spirit, one shaped by plummeting through the mediasphere. The automobile shaped the Cubist conception of space; the space depicted in these huge, dynamic, colorful glossy varathaned collages derives from the daily deluge of information that all of us negotiate every day, the background radiation of our vibrant, hectic mindspace, where skeletons, fan dancers, gas-masked skulls, angels and flying pigs all flash on, do their shtick, and vanish. Like Pop Art, these paintings both celebrate commercial culture’s pizzazz and power and criticize its lurid repetitive vacuousness; but Hernandez’s coloristic and compositional brio make resistance, in the end, futile. Roberta Loach’s paintings take a more satirical look at the contemporary scene, contrasting it with traditional pre-industrial life in her lively acrylic and gouache paintings, which make the Kayapo Indians of Brazil our foils — and us, theirs. In World Class Beauty, Loach limns the essential equivalence of young California and Kayapo women, pierced and tattooed, with hair carefully arranged. In her Dubious Enculturation pieces she pokes fun at globalization’s incongruities and our naïve propensity to idealize ‘primitives’ as Rousseauian Noble Savages: a rain forest Indian wears a tie with The Douanier Rousseau’s Snake Charmer, and holds a can of Diet Coke. Carlos Loarca’s huge acrylic on canvas paintings mix fiery, sumptuous color (dating from his childhood among the colorfully garbed Maya of Guatemala), dream imagery, art and anthropological motifs, and an experimental, intuitive working method employing collage and sculptural elements. The works become, because of their size, a immersive theater of color in which figurative elements suggest possible narratives to the viewer, who becomes a collaborator with the artist in this shared vision. Diana Marto’s sumi drawings, cast paper collages, and videos derive from her studies of oriental painting and her dance/storytelling/musical performances on the theme of balance between humankind and nature. Her video sensitively documents the slow dissolution via wind, tide and scavengers of a whale that washed up in Big Sur; she has done installations with the same theme, and made cast-paper sculptures and calligraphic ink drawings of whale bones. Her cast handmade paper pieces include natural elements like kelp and seaweed; the large, free-hanging ones resemble banners made in collaboration with nature; the smaller ones resemble bits of flotsam and jetsam wrapped in spume or enshrouded for devotional ritual. Irving Norman’s satirical paintings are the most overtly political works in this show. Although he passed away in 1989, his uncompromising Orwell-meets-Escher social surrealism has been getting renewed (and well-deserved, if belated) attention lately. Norman’s disgust with the abuses of political, economic and military power and how they shape modern life comes across as powerfully today as during the Cold War when these pictures were created, with infinite patient labor; his compassion for an oppressed humanity survives also. Officers’ Club depicts a group of identical generals, faces withered, their chests like the prows of boats, relaxing over drinks on a lawn made up of screaming blades of grass. Draftee presents a robotic general with spiked helmet and cannon-blast head leading yet another naked young recruit to eternal glory. Alfredo Paz, a dancer and installation artist, contributes in his ofrenda (memory table) Table of Ancestors a montage of artifacts from a Mexican ranch where he once lived. Beneath the glass-topped table, which resembles a museum vitrine, are an Aztec sacrificial figure, photographs of family and friends, stuffed birds, shells, candles, a stone altar, and Day of the Dead calaveras (sugar skulls) and papel picado, cut paper with light-hearted reminders of our common mortality. Paz also performed an affecting dance for the exhibition opening. Clayton Thiel aims at restoring magic and narrative to contemporary sculpture, and his large ceramic heads achieve a synthesis of archaic Greek, Egyptian, and Assyrian sculpture and more recent precursors, like Brancusi, perhaps. His child’s heads’ closed eyes invoke the Buddha, and perhaps Orpheus and John the Baptist; life and death are likened to dreaming; Other archaic metaphors invade these heads: in King Head a palisade of ancestor figures forms a crown around the brow; in Night Sky a shooting star forms a third eye on the cerulean head with its horizon of trees beneath; in Head in Labyrinth a maze grows in the hair, revelatory of the windings of the brain within, and the tortuous path of life. Finally, kudos to Torphy and to Betsie Miller-Kusz and Carlos Loarca of Somarts for their fortuitous roles in creating the show from a poem and a vision. Environmental activist John Seed said of his work, “It’s not me…trying to protect the rainforest. Rather, I am part of the rainforest protecting myself…that part of the rainforest reverently emerged into human thinking.” Perhaps we’re all connected in the great work of transcending our “skin-encapsulated egos (Alan Watts)” and becoming worthy of this great country and planet.